The Cross River Gorilla (Gorilla gorilla diehli), the rarest and most threatened of gorilla subspecies, has reason to cheer. Last month, on September 29, the Prime Minister of Cameroon, Philemon Yang, signed a decree to officially create a new protected area – Tofala Wildlife Sanctuary – in the southwestern part of the country. “Tofala Wildlife Sanctuary is very important in the sense that it occupies part of the very limited geographic range of the critically endangered Cross River Gorilla,” said David Greer, Coordinator of the WWF African Great Apes Program. The Cross River Gorilla (Gorilla gorilla diehli) is the rarest gorilla subspecies in the world. Photo courtesy of African Conservation Foundation. Fewer than 300 Cross River Gorillas remain in the wild. These great apes, listed as Critically Endangered under the IUCN Red List, occur only in a small, hilly, rugged tract of land at the Nigeria-Cameroon border marked by a matrix of forests, farmlands and villages. Both these countries face rampant deforestation due to a number of threats. Nigeria, for instance, lost over one million hectares of tree cover from 2001 through 2012 according to data from Global Forest Watch. Cameroon, about half the size of Nigeria, lost approximately half a million hectares of tree cover during the same time period. A bit of an enigma, the last few remaining cross river gorillas in the world occur in a 12,000-square kilometer (4,633-square mile) landscape in 14 small, fragmented populations. These isolated populations are abysmally small, ranging from six to thirty individuals. Cross River gorillas diverged from western lowland gorillas (Gorilla gorilla gorilla) around 20,000 years ago, and live about 300 kilometers (186 miles) away from the nearest population of western lowland gorillas. While the two subspecies look similar, the sizes of their skulls and teeth differ. In Cameroon, the major cross river gorilla conservation sites include Kagwene Gorilla Sanctuary, Mawambi Hills, Mbulu Forest, Mone River Forest Reserve, Takamanda National Park and the Tofala Hills Complex. 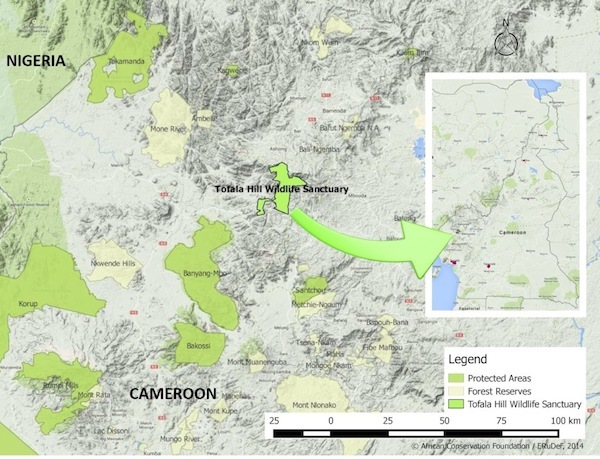 These sites together hold between 132 and 194 individuals, according to the Revised Action Plan for the Conservation of Cross River Gorilla 2014-2019. Location and extent of the new Tofala Wildlife Sanctuary. Map courtesy of African Conservation Foundation/ERuDeF. The Tofala Hills area can almost be considered an outlier within this mostly contiguous forested landscape matrix. It lies 40 kilometers (25 miles) away from the nearest Cross River Gorilla locality in Mone River Forest Reserve in Cameroon and forms an important stronghold for these great apes. About 20 to 30 gorillas are estimated to occur in the Tofala Hill Complex. In addition, more than 355 bird species have been recorded in the highlands, according to Arend de Haas, director for the African Conservation Foundation (ACF), and who is involved in the Cross River Gorilla Program. Out of these, 50 species are endemic to the afro-montane highlands and 15 species are globally threatened, he said. 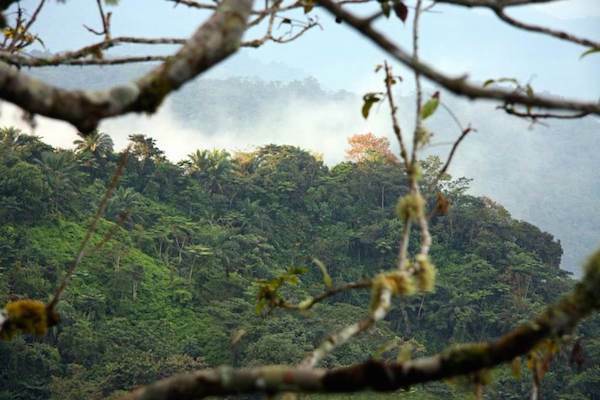 Lush montane rainforest dominates the Tofala Hill landscape. Photo courtesy of African Conservation Foundation. This region is also home to an endangered chimpanzee subspecies, called the Nigeria-Cameroon chimpanzee (Pan troglodytes vellerosus). According to the IUCN Red List, it is the least numerous subspecies, with fewer than 6,500 individuals remaining in the wild. Endangered primates like drills (Mandrillus leucophaeus) and the Preuss Guenon (Cercopithecus preussi) also occur in the lowlands of Tofala. The African Conservation Foundation, together with the Environment and Rural Development Foundation (ERuDeF) has been working in the Tofala-Mone Forest Landscape since 2004. Following these initial surveys, ERuDeF and its partners began participatory demarcation of the Tofala Hill Wildlife Sanctuary boundaries. They also implemented new education initiatives, a local livelihoods development program, and continued to monitor great apes populations. 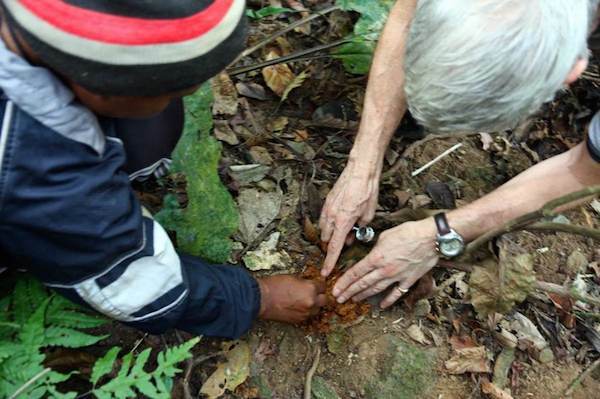 Conservationists examine possible evidence of ape presence during a survey. Photo courtesy of African Conservation Foundation. The declaration of this region as a wildlife sanctuary adds a layer of protection for the small population of gorillas here. However, a number of threats loom over the subspecies. According to Global Forest Watch data, the Tofala Hill area lost about 13,000 hectares of tree cover from 2001 through 2012. Some of the larger threats include logging. 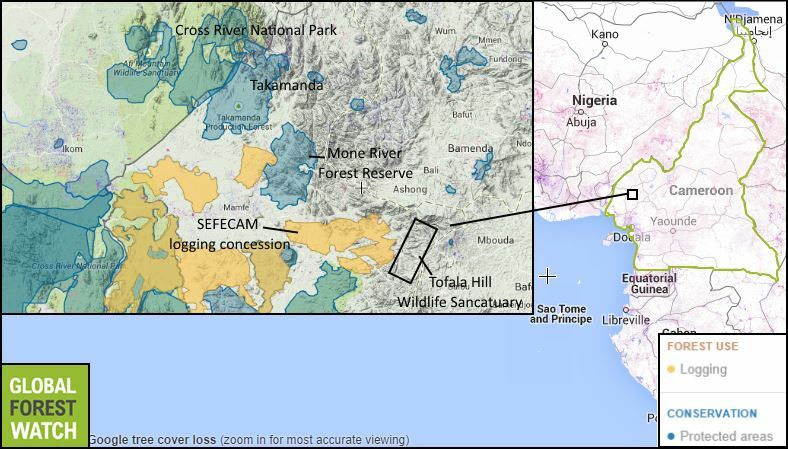 Global Forest Watch shows logging concession belonging to SEFECAM near Tofala. Palm oil concessions, too, are becoming fairly common in Cameroon. But there is currently no large scale mining in or near Tofala Hill Wildlife Sanctuary, de Haas said. The SEFECAM logging concession covers a large area near the new new reserve. Map courtesy Global Forest Watch. Also, as people, livestock and gorillas live in closer proximity than ever, gorillas are increasingly threatened by diseases like Ebola, anthrax and other human-borne diseases. With populations dwindling to fewer than 300 gorillas in the wild, death of a few individuals can be a major blow to conservation efforts. To ensure that the newly established wildlife sanctuary actually works, improved wildlife law enforcement and judiciary process is critical, Greer said. “The problem is, corruption is so rampant within the wildlife legal system, that blocking attempts to corrupt the process are as important as catching someone in the act of committing a wildlife crime,” he said. According to de Haas, finding alternatives for agricultural encroachment and forest conversion, educating people living around the park, and developing sustainable development opportunities are crucial to protect the great apes and other wildlife in this area.